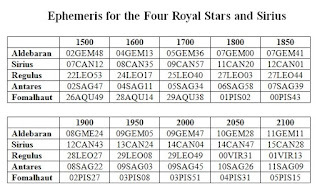 Here is a ephemeris for Sirius and the Four Royal Stars (Aldebaran, Regulus, Antares, Fomalhaut). Golden Dawn, and its Inner Order (RR et AC), consider Regulus, one of the ancient Persian Royal Stars, to mark the first degree of the zodiac. 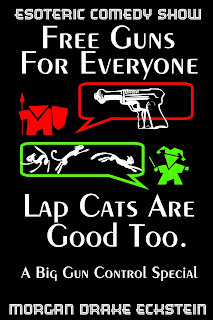 Several sub-systems that are connected with GD astrology, including the Golden Dawn system of Tarot, start in the first decan of Leo which starts at the position of Regulus, according to the original founders of Golden Dawn (Westcott and Mathers). In my own practice, mostly using standard Western astrology, I use the Tropical Zodiac rather than the Sidereal of India; nor do I use the Rosicrucian Sidereal of Golden Dawn. 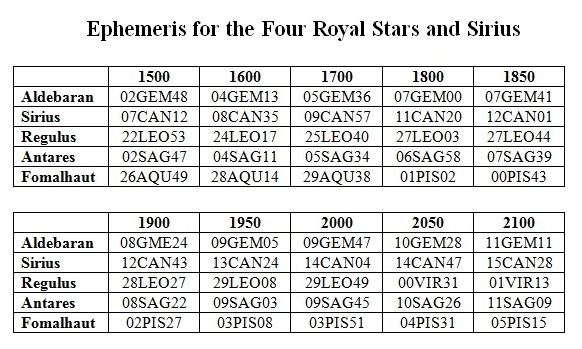 But I do make note of Regulus, as well as the Four Royal Stars, just in case, there is something to initiated system. For those who are interested in futher information about Regulus, and the other three Royal Stars, as well as Sirius (the most important star to the Ancient Egyptians, as well as the brightest star in the night sky), I wrote an article that was published in the Winter 2015 issue of the Golden Dawn journal, Hermetic Tablet (also available in hardcover from Lulu).